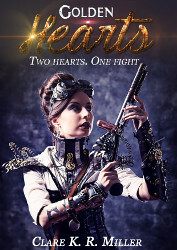 Golden Hearts is being reissued with a new cover! And when I say “reissued,” I just mean I’ve uploaded new versions and a new cover to the various sites; it’s only available in ebook, after all. When Sher asks for aid from the bird-woman inventor Melowren, she does not expect to fall in love. But it happens anyway: suddenly, completely, and for both of them. They have no time to do more than enjoy it, for their cause—freeing their city from its dictatorial queen—trumps all. They choose to fight, but the hopelessness of the cause threatens to pull them under. Only their love can keep them safe. Next postNow at Google Play!